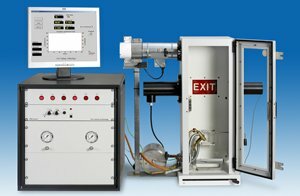 The FTT ASTM D2843 test chamber is designed for the measurement and observation of the smoke-producing characteristics of plastics under controlled conditions of combustion or decomposition according to ASTM D2843. A small specimen is burned inside the chamber and the reduction of light transmission is measured via a photometric system. This test is referenced in building codes (including the International Building Code) as an alternative to ASTM E84 for assessing smoke released by light transmitting plastics. It is one of three tests needed to classify light transmitting plastics for use in buildings.